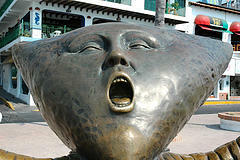 Photo by WonderlanePeople are weird about singing. Even though singing is a skill, many people view it as something you either have or you don't, like red hair. However, it is my belief that anyone who can speak can learn to sing. Of course, some people have prettier voices than others, just like some people have prettier faces. But just because you don't sound like Sinatra doesn't mean you can't sing. I don't look like Christy Turlington but I still go out in public and I even put on makeup once in awhile. The average tennis club is filled with a bunch of people who, I'm guessing, can't serve like Nadal but still have fun playing the game. Still, people allow singing to be something best left to professionals, even though it is the most organic, natural, and immediate way to express yourself musically besides drumming on tabletops and steering wheels. Here, I would like to help those of you who would like to get better at singing, even if you, as they say, "can't carry a tune in a bucket." I should mention here that the ideas below are based on my personal experience working with beginning singers; nothing has been peer-reviewed or written up in scholarly journals. YMMV, but hopefully you will find something helpful. The first thing that is helpful is to separate the mechanical aspects of singing from the aesthetic ones. I have eyes, ears, nose, and mouth that function appropriately - the elements of my face do what they are supposed to do, regardless of what I may think of it when I look in the mirror. Likewise, if you can speak, you are drawing air across your vocal cords and everything is in good working order. You can physically make the sounds necessary for singing, even if you don't like them. So now, imagine that I sing a pitch (in other words, I produce a tone), and I ask a student (say, a four-year-old boy) to copy me. "La" I sing. "La," he echoes. Can you tell if those two pitches matched? In other words, were they the same or different? If your answer is generally yes, then you have completed the first musical hurdle. If you can tell by ear that two pitches are the same or different, you are on your way to reproducing those pitches correctly with your own voice. If you can't tell the difference, then we would try it again and I would then tell you the answers, so that you could repeatedly experience what it feels like to hear two pitches that are the same, and two that are different. Next, it's your turn. I would sing "la" and then you would echo me. Can you sing the same pitch as me? If you aren't able to match my pitch, can you tell if you are higher or lower? Manipulate the sound to move it up or down. With small children, I will have them make a puppy noise or imitate a baby to find their higher register, and bark gruffly or roar like a lion to find lower sounds. If you're getting pretty close to matching my pitch, I would then hold my tone while you attempt to match me again. When you match my pitch, there will be a perceived intensification of the vibration as the frequencies line up. It's similar to the way it feels to hold two magnets as they make contact. With practice, you will improve your ability to "lock in" on a pitch immediately. The strange thing about being a singer is that there are no keys or strings to press. You just have to try different things until you figure out what it's supposed to feel like. A voice teacher can be helpful, saying "Yes! Like that!" when you're on the right track. Experimentation is key. That's why it's so important to forget about sounding pretty, because many of the sounds you make on the way to beautiful singing are downright terrible. You're getting to know your own voice, the way a baby kicks and flails and wiggles as he learns that his legs and arms are connected to him. If you are having to practice matching even one pitch, how will you ever sing a melody line? The answer is muscle memory. As skills develop they will become automatic, allowing you to build upon them. The baby who just a few months ago was wiggling around in his car seat is now pulling himself up on furniture. Soon he'll take a step and fall down, and then he'll be able to, with great concentration, take several steps across the room. Before long, what used to take great effort and attention will become second nature as he walks, runs, skips, jumps, dances, swims, skis, and skateboards. Don't be discouraged by the fact that you're not a baby. You can still learn. I have worked with many people who said that they couldn't sing, only to succeed (sometimes even within minutes!). Below, five practical tips for improving your ability to sing on pitch. 1) Just sing. Be sure to include some moments of singing a capella (that is, with no recordings or instrumental accompaniment). Get used to the sound of your own voice even if it makes you cringe at first. Remember, the fact that you can tell when you're off is a powerful tool for eventually being able to self-correct. 2) Practice matching pitches that you hear. Acknowledge that singing a complete melodic line might be aiming too high - you'll probably just do it the way you've always done it until you create better habits. Try just hitting one note of a song you're listening to in the car. 3) Learn your range. I once worked with a young woman who was preparing to sing a song at her own wedding. She thought she was terrible and came to me in desperation. It turned out that the song was way, way too low for her. We moved the song up a few steps and an effortless, beautiful sound popped out. 4) Visualize your voice as an instrument. Inexperienced singers can follow the ups and downs and general contour of a melody, but they tend to be imprecise. My singing improved significantly when I aimed to sing each and every note squarely on pitch as though I were playing the melody on a flute or clarinet. 5) Be a mimic. Sometimes the way you sing something facilitates being able to sing it on pitch. The swoops, glides, and other stylistic elements that pop singers use to embellish their performances are sometimes ways to cover up vocal inconsistencies or navigate an otherwise challenging melodic turn. It's easy to overdo it and it's generally verboten in classical or choral singing, but it's nice to have a bag of tricks. In any case, imitating great singers is a time-tested way to become one. Is anything here applicable to your experience? Do you have any personal experiences or tips to share when it comes to learning to sing? Let me know in the comments!